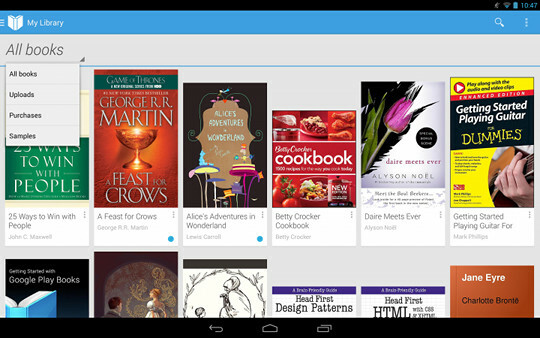 Google has updated their Play Books app (such a silly name for an ereading app, don’t you think?) to add some new features and stability improvements. The most notable of the upgrades is the ability to be able to upload ePub and PDF ebooks from your Android phone or tablet to Google to read in the Google Play Books app. As you may recall, back in May Google first introduced personal ebook uploads for PDF and ePub ebooks from computers using modern web browsers, but it didn’t work with mobile devices or apps. And it still doesn’t work from Android devices as far as I can tell. Since the new update, I’ve tried to upload various ePub and PDF files from my Nexus 7 2 and there simply is no option to do so, even though the latest 3.0.15 version of the app is installed. At first I thought the option to upload would be in the actual Play Books app under uploads, but I guess that would make too much sense and be far too easy. Instead Google says that you have to touch the file to open it and choose “Upload to Play Books” from email or downloads, but I get no such option from “Downloads” or when using a file explorer or any other way. Email doesn’t work either. In fact I found that a) the Nexus 7 cannot upload ePub and PDF files at all from the Gmail app and b) the Nexus 7 is incapable of opening ePub files from email; it just says there’s no app available to read the file, even though I have several ePub-supporting apps installed. It’s good to see that Google is giving users more ways to read non-Google ebooks in the Play Books app, but it would be a heck of a lot easier if Google would just let users sideload ebooks that are on their device into the Play Books app without having to mess with uploading. There’s not a single other ereading app that I can think of that doesn’t allow for sideloading, just Play Books. Books open more quickly and smoothly. Upload EPUB or PDF files to your library from your phone or tablet. From email or Downloads, touch the file to open it and choose Upload to Play Books. Improved look and feel of highlights and notes. Lower brightness settings, for better reading in low light. Read any book in landscape view. Dismiss recommended books in Read Now. Additional improvements in performance, stability and accessibility. It worked for me using my Kindle Fire HDX and Dropbox and Google Drive. I just tapped on the epub file and it gave me the option to upload. Good luck! Works from my Android phone too. I have actually had no problem with with Google Play books working on my Nexus. It did give me a pop-up choice of where to “upload” the book. Also, when I moved some of my books from my desktop into my Google Play Books online, they all opened right up in my Nexus within a few seconds. Maybe there’s been another update since this post… not sure, but it’s been working fine. Also working fine on my Android run cell phone. thanks. Yeah, the option shows up now for me too.